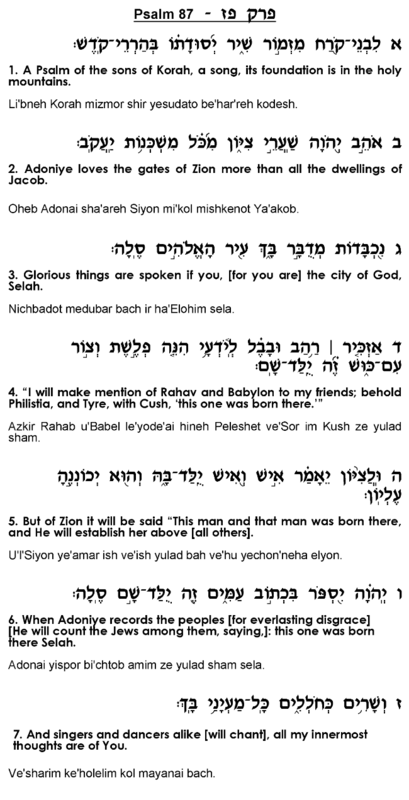 Psalm 87, which ranks among both the shortest and most difficult chapters of Tehillim, is essentially a song of praise for the great city of <?xml:namespace prefix = st1 ns = "urn:schemas-microsoft-com:office:smarttags" />Jerusalem. 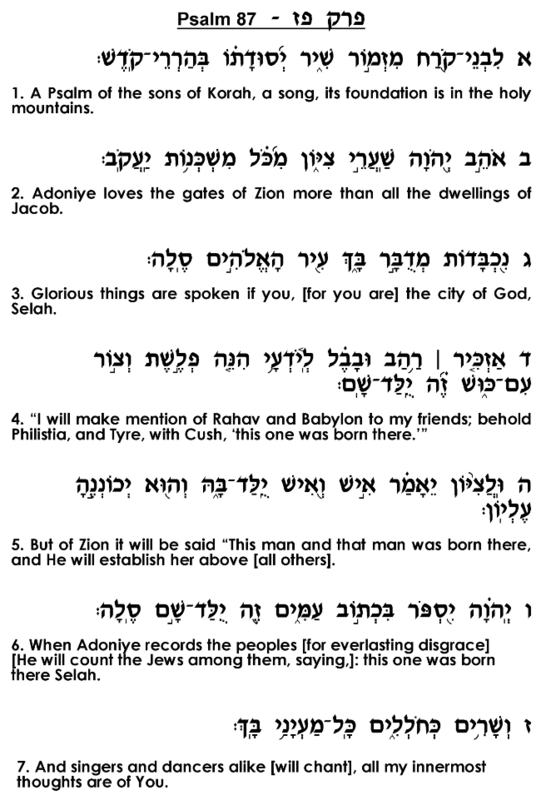 The author declares that God loves "the gates of Zion" more than all other areas of Israel (verse 2). According to the Targum, this verse means that God appreciates the Torah learning in the academies of Jerusalem more so than the prayers held in all the synagogues throughout Israel. The unique status of Jerusalem is thus attributed to its functioning as the nation's center of Torah learning; it is this role that renders it the most beloved of all cities in the Land of Israel. 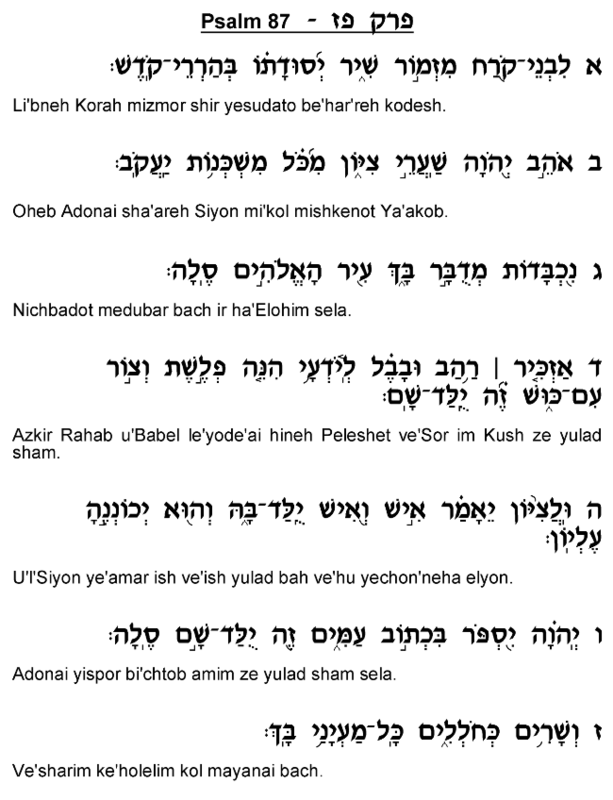 In verses 4-5, according to the interpretation of Ibn Ezra and the Radak, the Psalmist draws a contrast between Jerusalem and the other major countries in the region, noting the disproportionately large number of accomplished scholars produced from Jerusalem. These other nations produced great personages only once a generation or so, whereas Jerusalem was renowned for the great wisdom and scholarship that continuously emerged from its ranks. In this chapter's final verse, as the Radak explains, the author notes how Jerusalem earned considerable attention and focus on the part of the poets of the time, including the author himself. The grandeur and mystique of this great city enchanted the creative minds of the poets who used their literary talents to extol its splendor. According to the Targum, this verse speaks of the beautiful songs of praise and captivating music that were sung during the offering of sacrifices in the Mikdash, which served to enhance Jerusalem's role as a source of spiritual inspiration for all mankind.